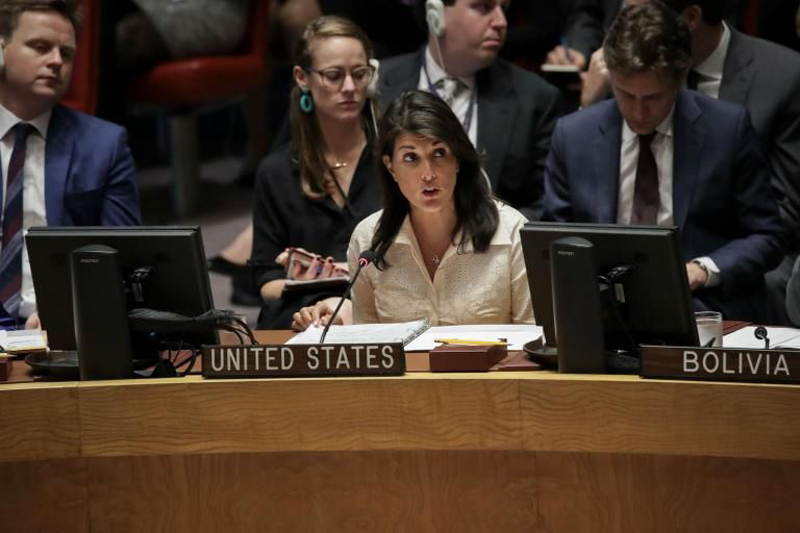 The US Ambassador to the UN has claimed “no country would act with greater restraint than Israel”, as the death toll of Palestinians killed by Israeli troops passed 60 and officials said 2,700 had been wounded. While the shooting of mostly unarmed Palestinian protesters at the Gaza border fence received widespread international condemnation, criticism within the US was muted. Nikki Haley repeated a claim made the day before by the White House, and said Hamas, the militant group that controls Gaza, was responsible for the deaths and injuries. While reports from Gaza suggested the majority of protesters were unarmed, Ms Haley called attention to the tactics employed by some, which included the use of Molotov cocktails attached to kites. She also accused Hamas of making use of loudspeakers to urge protesters. The Palestinian ambassador, Riyad Mansour, addressed the council. “How many Palestinians have to die before you take action? When are you going to act,” he said, according to the Associated Press. United Nations secretary-general Antonio Guterres said Monday’s killing of more than 60 people showed the need for a political solution to the conflict. Speaking at the headquarters of the European Union, he said the way out of the standoff was “a two-state solution allowing Palestinians and Israelis to live in peace and security together”. The pro-Israel lobby is a powerful influence in the US and groups such as Christians United for Israel and American Israel Public Affairs Committee (AIPAC) spend millions of dollars to further their causes. The Israeli prime minister, Benjamin Netanyahu, has spoken several times at AIPAC’s annual conference, most recently in March. The demonstrators in Gaza have been protesting since the US announced unilaterally last December that it was recognising Jerusalem as the capital of Israel and moving its embassy there from Tel Aviv. For decades, the international community had insisted that the final status of Jerusalem had to be part of a broader settlement between the Israelis and Palestinians. Donald Trump, who pleased his evangelical supporters by recognising Israel as the nation’s capital and who had vowed to do so during the 2016 election campaign, said the move was merely responding to a reality on the ground. Democratic minority leader Nancy Pelosi condemned Hamas and said Israel had the right to defend its borders, but added: “We hope Israel will use all appropriate restraint, as we urge both parties to move towards negotiations that will ensure the safety and wellbeing of both Israelis and Palestinians.